On January 14, 1962, four Lutheran families (Emil & Hermine Schmidt, Edward & Clara Donahue, Stanley & Mabel Kies, and Gar y & Jacqueline Hatfield) met at Mt. Hope Lutheran Church in Grayling, Michigan to plan the establishment of a mission in Kalkaska. Being close to the liturgical observance of the conversion of St. Paul, the Apostle (celebrated on January 25), the new mission was named St. Paul Lutheran Church. Rev. Donald R. Beyer would serve as pastor for St. Paul, along with his call to serve the people of Mt. Hope in Grayling. The first worship service was held on February 25, 1962 in the auditorium of the Kalkaska High School, with 39 people present. In April 1962, the Sunday School was organized with 23 children enrolled. Soon a youth program, ladies guild and voter’s assembly were established. As the Michigan District met in convention in June of 1962, St. Paul was officially recognized and accepted as a congregation within The Lutheran Church, Missouri Synod. On August 13, 1962, the congregation began work for a permanent house of worship. Elected to serve on the building committee were Dr. William Kitti, Mrs. Clara Donahue, Mr. Edward Elzinga, Mr. Clinton Walter, and Mrs. Jacqueline Hatfield. On June 4, 1963, the land was purchased at the north edge of the village of Kalkaska, on US 131. 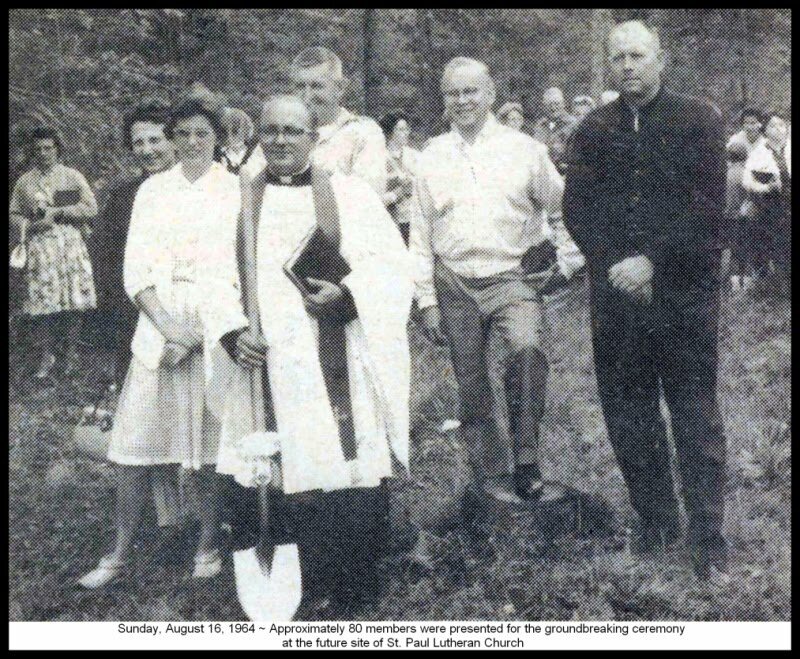 On August 16, 1964, members and friends gathered on the property site for ground breaking services. The completed building was dedicated on December 13, 1964. On July 11, 1971, Rev. Geary F. Bird was ordained into the pastoral office and installed as St. Paul’s first full-time pastor. Pastor Bird and his family moved into the parsonage on Dresden Street. During Pastor Bird’s years with St. Paul, he was also commissioned by the Michigan District to begin a mission congregation in Bellaire, which is now Hope Lutheran. Pastor Bird also served as the vacancy pastor for St. Matthew Lutheran Church in Mancelona. In early October 1975, Pastor Bird received and accepted a call to serve as pastor of Evergreen Lutheran Church in Detroit, Michigan. of Trinity Lutheran Church in Edwardsville, Illinois. Pastor Turanski served St. Paul for nearly 33 years. In that time, St. Paul had added on to the existing structure, creating a larger worship space, a kitchen, several classrooms, and new office space. In 2000, Pastor and his wife, Lynette started a preschool at St. Paul, where Lynette served as director and teacher. Both Pastor and Mrs. Turanski retired from the ministry in June 2008, leaving two key positions within the church vacant. The preschool continued under the leadership of several teachers/directors, and currently operates withMrs. Dianna Goodale serving in this role. In late November 2008, the congregation elected to callRev. Chad E. Hoover to serve as St. Paul’s fourth pastor. Pastor Hoover is a 2004 graduate of Concordia Theological Seminary in Fort Wayne, Indiana. His first call was to serve as Assistant Pastor at Trinity Lutheran Church and School in Traverse City, Michigan. The installation service for Pastor Hoover was held on January 18, 2009. In August 2014, Pastor Hoover received and accepted a call to serve Concordia Lutheran High School in Fort Wayne, Indiana as Department Head/Religion Teacher. His last Sunday at St. Paul was September 7, 2014. Since the foundation of St. Paul Lutheran Church in 1962, the community of believers in this place has continually received the blessings of Christ through the true preaching of His Word and the proper administration of His Sacraments “all to the glory of God” (I Corinthians 10:31).